Nature can sure keep us hopping! Last week we had single digit temperatures, significant ice and snowfall and today, sunshine and warm temperatures are again raining down. March is known for this behavior but never-the-less it sets our mind spinning a bit. The still-frozen ground and melting snow has made for a “mud season” for us, a term familiar to many New Englanders and folks of more northerly climes, describing the mucky conditions of spring thaw. When walking around earlier this week, when my ears weren’t filled with the squishing sound of the earth beneath my feet the familiar sound of buzzing filled the air; bees. We are not the only ones that are uplifted by the sight of the flowers of late winter. For honeybees and other early pollinators, these flowers are an important food source for this time of year. 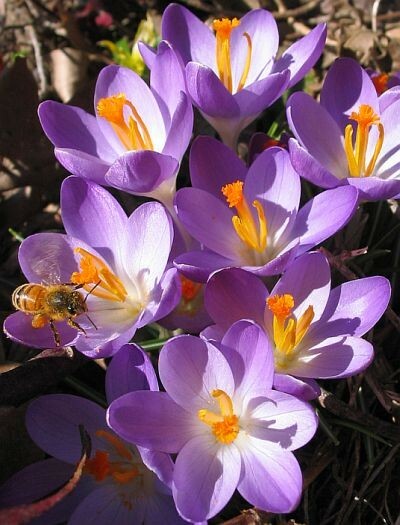 Honeybees are not native to the United States but then again, neither are our early bulbs yet the two provide a wonderful symbiotic relationship with each other—food source and pollination—in their “new land”. In speaking with fellow gardeners in the region, many of us have shared a secret love of winter—simply for the fact that it is a time that gardeners can “do something else” besides garden! Under normal circumstances, it is a time when a gardener can have a “single thought” rather than going in a thousand different directions as the garden often “makes” us do. Winter can be a reflective time for pruning, planning and cleanup. This winter however was not a normal winter and time outside was often too downright cold. Spring officially begins next week and gardeners are lined up at the gate, waiting for the starter pistol to ring out but that is next week. This week, a simple walk around Winterthur may provide that soul-filling experience that did not unfold until just about now. The March Bank and surrounding areas are filled with snowdrops, crocus, winter aconite, adonis, a few spring snowflake and early flowering shrubs such as witchhazel. The bees are buzzing, the flowers are emerging, the birds are beginning their mating songs and the beauty of the winter landscape is still present—just with a little more friendly temperatures. Not a bad reason to visit, is it?